GRANOLA is a fabulous health food, packed with a variety of nutrients (especially minerals) and fibre. Unfortunately many of the commercially prepared granola and muesli products are loaded with sugar. Even some home made recipes have too much sugar in them. I was horrified to come across one such recipe that had a trio of sugars in it: white sugar, brown sugar, and honey (each at approximately 1/2 a cup), plus raisins and other dried fruit. That’s worse than the sugar content in many regular commercial cereals! To me, adding sugar to naturally healthy products is not a good idea, especially when the addition of dried fruit (and a touch of honey) is more than enough sweetness! 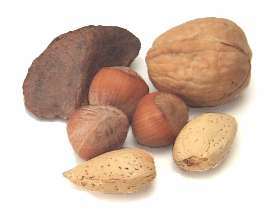 * other NUTS can also be used, including filberts (hazelnuts), pecans, and walnuts – as long as they are unsalted and unroasted! ALL nuts (except cashews) should be soaked for at least 3-4 hours or overnight, then rinsed well before using. 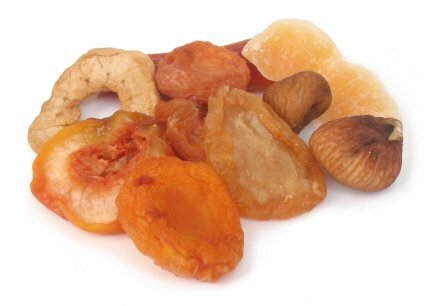 ** other DRIED FRUIT can also be used (e.g. bananas, currants, cherries, blueberries, apples, pineapple) – just make sure it’s organic and naturally dried (i.e. sulphur-free) whenever possible. * SESAME SEEDS can also be added into the mix. * HEMP HEARTS can also be stirred in after the granola is done toasting. When cooled, store in an airtight container. Amount per serving: 2-3 tablespoons (really delicious with cold coconut or almond “milk”). The whole baking thing is optional – it’s only recommended if you want that crunchy, nutty flavour to your granola. If you opt out of the baking bit you’ll also have to skip the honey and vegetable oil and then you’ll have muesli instead. This recipe is delicious! I skip the honey entirely and use melted coconut oil. It adds a little sweetness in a healthy way. I also found steel-cut oats and use them as my base. Excellent!